iamafeeder.net » Get Your Grill On – A Review & A Give-Away! Get Your Grill On – A Review & A Give-Away! 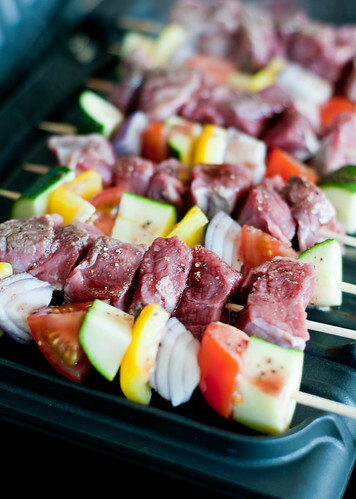 Did you know that last week was National Get Grilling Week? Neither did I, but then some lovely folks with George Foreman got in contact and asked if I’d like to review a grill for it, and oh, by the way, would you like an extra one to give-away to your readers? My response? Bow-chicka-wow-wow! 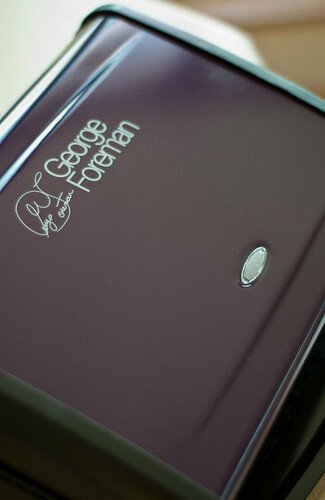 When I was at University (not so very long ago) I had guy friends who swore by their George Foreman. 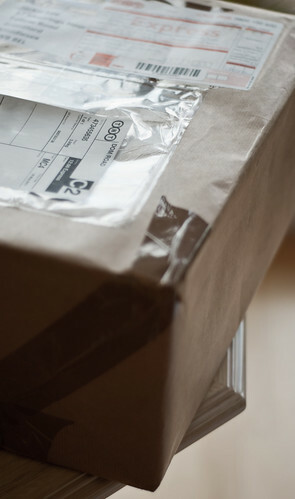 I wasn’t so sure about it – it sat on their kitchen table covered in grease, a frozen river of white congealed fat hanging off it into the drip tray below. But my friends, rugby and football boys, claimed it was the greatest device to grace their house as it helped them to stay healthy. They did, however, tell me this whilst shovelling pizza into their mouths almost faster than they could swallow. The way the grill works is that it helps to cook off excess fat, using its special design and high temperature. 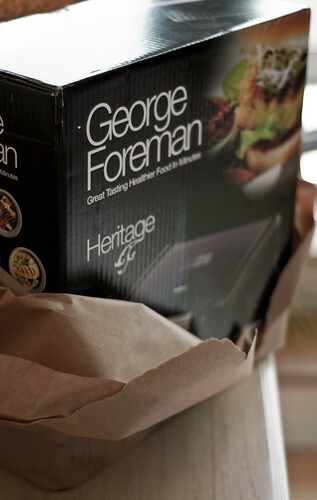 I love food but I am also constantly struggling with a way to enjoy what I eat and be healthy, but the George Foreman is so versatile that you can enjoy a whole host of foods and be very health conscious at the same time. And as for the drip tray, though that was my turn off when I saw my friend’s grill, that’s only because they didn’t clean it. It’s very easy to clean, too – simply use the specially designed scraper to scrape the grill clean and wipe it down with a damp cloth. We’ll have no congealed fat in this house, please! My grill is a special purple Heritage grill, exclusive to Argos. I was given a couple of recipes to try out, the first the George Foreman Original Burger. You can see how the fat drained off the burgers – this actually also helped to give the burger a really lovely texture and outer-crust. 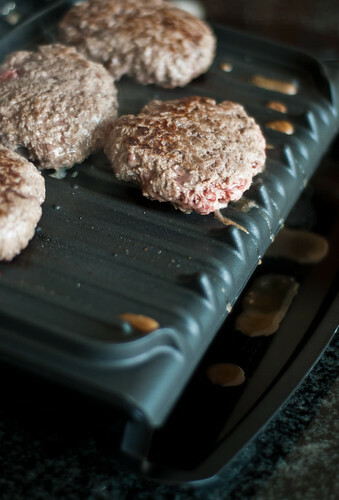 We don’t have a grill or a barbecue in the flat so I’ve never been able to make burgers unless I pan-fry them, a method that is a lot more unhealthy and leaves my hair and the flat smelling like grease; with the George Foreman you don’t get that greasy smell that stays in all of the furniture, just perfectly cooked food. Even better, most of the ingredients were readily available in my kitchen cupboard so I not only saved my furniture, I also saved a few pennies! And as for the burgers? They were really good – I’d definitely make them again. 1. 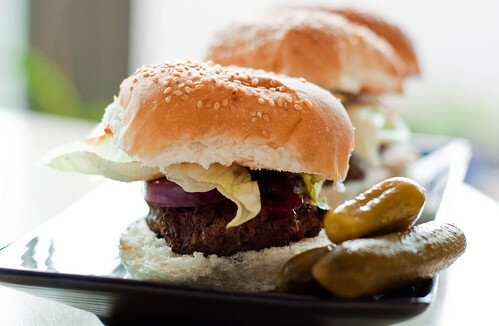 In a medium bowl, mix the beef, Worcestershire sauce, black pepper & shape into 4 hamburger patties. 2. Place the hamburgers on a pre heated grill for 4 minutes. 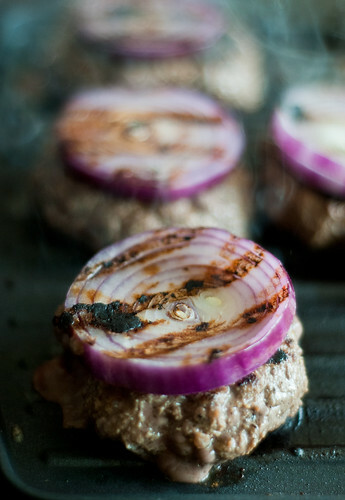 Top each one with a slice of onion and grill for 3–4 minutes, or according to your preference. 3. 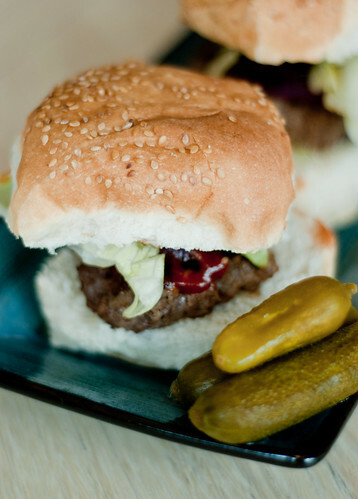 Serve the hamburgers on the buns and top with your choice of accompaniments. The second recipe for review was the George Foreman Mediterranean Beef & Vegetable Grill. I really liked this. It was simple, easy and great for a family dinner. Plus, grilled vegetables are one of my favourite things. It was a tiny bit on the dry side, but I think I just grilled it for too long. I used a yellow pepper instead of green for some colour and switched out the regular balsamic vinegar for pomegranate balsamic which has a delightful sweetness that played against the beef perfectly. 1. Partially freeze the steak for about 30 minutes. Remove any visible fat and cut the beef into very thin slices across the grain of the meat. Thread the steak through 4 of the skewers and then thread the vegetables through the remaining 4 skewers, alternating vegetables on each. 2. In a small bowl, mix together the vinegar, pepper and garlic granules. 3. 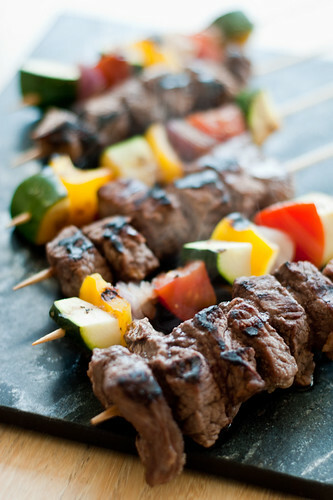 Place the beef skewers on a pre heated grill for 4 minutes. Add the vegetable skewers, sprinkle all the skewers with the vinegar, pepper & garlic granules mixture. Grill for an additional 3–4 minutes. 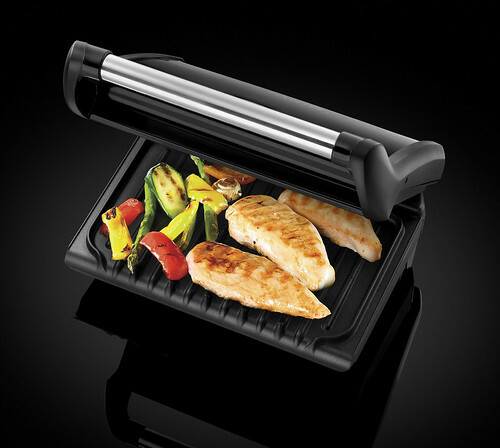 The grill cuts down your cooking time and works equally well with frozen food as with defrosted, which is great for lazy people like me who forget to take food out of the freezer in the morning/the night before and then scrabble to defrost it in the microwave at dinner time. 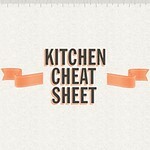 All around a great bit of kit to have in the kitchen for a conscientious eater! Family Heritage Grill photo provided by Manning Gottlieb OMD. If you could only have one kitchen gadget which would it be and why? For additional entries, follow @GeorgeGrillsUK on Twitter, then come back here and leave a comment saying that you did so. Please note, this give-away is open to UK residents only – sorry rest of world! I promise I’ll have a give-away for you guys soon! You have until midnight (GMT) on Tuesday 31st May to get your entries in. Hurry up, get entering to win yourself this bad boy! Get grilling, folks. Until then, peace and love. Please note: though the grills and ingredients for the two meals were provided by George Foreman for review, no monetary compensation was received and all opinions are my own. The give-away is open to UK residents only. Hi Jax, I am now following George. I’m following them! Those burgers looks amazing Jackie. Smile. I had one of these my freshmen year of college. We made some mean burgers! Thanks for sharing with me tonight. I hope you have a beautiful day tomorrow. The weekend is almost here! Hugs from Austin. Totally easy answer. My double-bladed hachoir. It’s excellent for its usual purpose of chopping herbs but I find it great at chopping chillies, tomatoes, cucumber and all manner of similar-textured items. Oh, and a bit of my finger once too. I couldn’t do without my automatic mixer – love emy cakes, and it’s far too much work to mix by hand! !